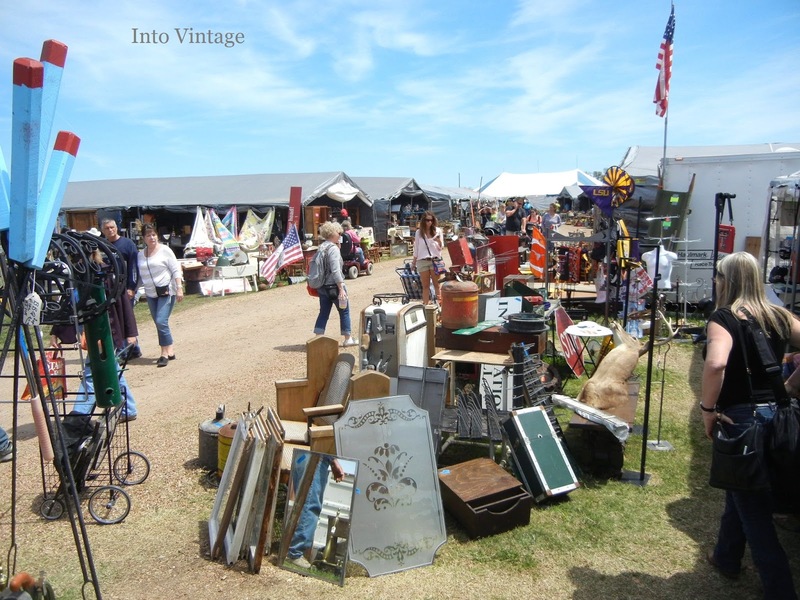 Is it okay if we just pretend that since returning from Texas a week ago, I’ve been mentally processing all that which is Texas Antiques Week and was not bogged down by tedious and boring technical difficulties? Day One, Stop #1. A random tent on the side of the road. My most amazing traveling companion*, Laurie/Magpie Ethel has written THE BEST day-by-day account of our trip, from sweet tea to rolling garbage cans and everything in-between, starting HERE. For me, this trip was first and foremost meant to be an adventure into the junking unknown (cue up theme from Star Trek) and a fact-finding mission for possible future trips. 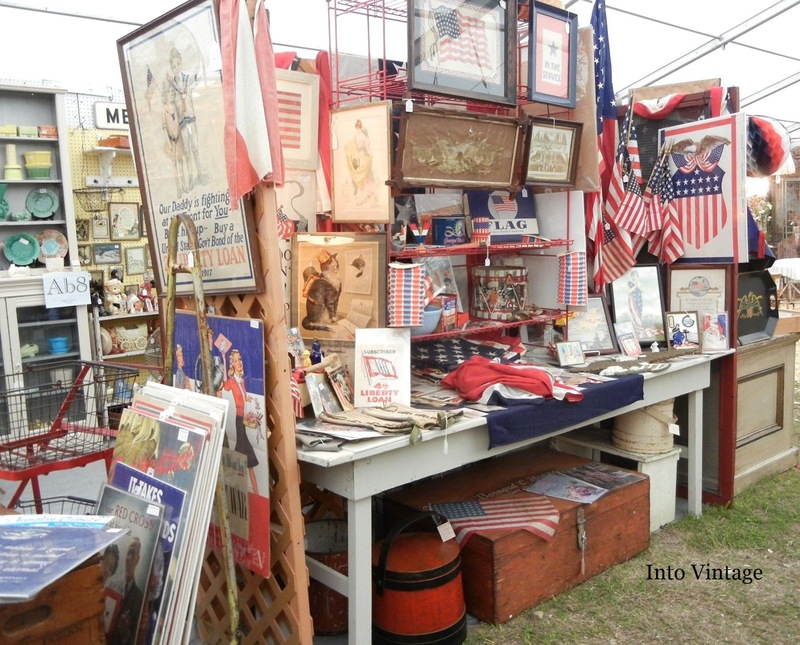 I also hoped to do a little buying for re-selling. And be inspired. Generally, prices were somewhat higher than what I had anticipated which is what happens when junking 2,100 miles out of my very affordable Pacific NW comfort zone. I had a bit of sticker shock at first but as a reseller, I also understood why the prices were what they were. 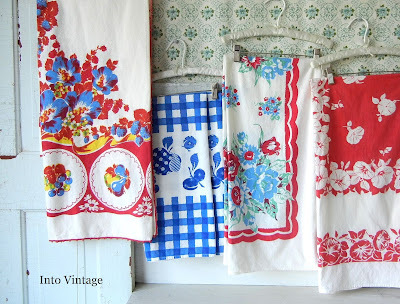 I confess I didn't understand the $125 very-nicely-ironed-but-nothing-I-hadn’t-seen-before vintage tablecloths. Ouch. Luckily, I found plenty of tablecloth bargains. Why we kept the 'Do Not Disturb' sign on our hotel room door. There were definitely deals to be found, especially toward the end of the week when the “50% Off Everything” signs started appearing and in the end I had no trouble at all filling two suitcases. To. The. Brim. (Thank you for the suggestion to nest one suitcase inside a larger, empty suitcase on the trip there – worked like a charm). One of the absolute highlights of this trip was meeting my longtime junking idol, Sue of Vintage Rescue Squad. It was a thrill to compare notes about junk, reselling and blogging, in person. I really do heart the internet all over again when it makes connections like that possible. 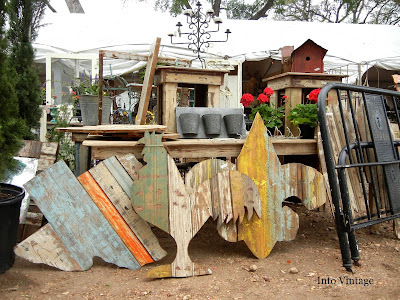 Sue, Laurie and I shopped the fields one day and I’m not sure which was more interesting … the shopping or watching what each of us gravitated toward. 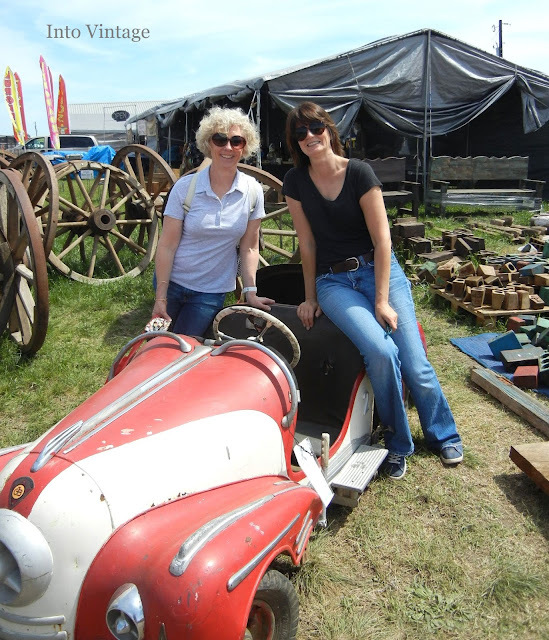 Overall, I would give the entire Antiques Week experience 5 gold stars! Would I go back? Of course! Want to go too? Let’s make a plan for next year!! *I could not have asked for a better or more compatible traveling / junking companion. Every single day we marveled about how well it was going and we were together, literally, 24/7 which included minimum 12 hours days of driving, junking and eating. Thank you, Ethel. You’re a peach. Amy - You're making me wish I had gone! I loved reading Laurie's detailed posts too. Looks like you had a wonderful week! can't wait to see more of what you bought. I love to go on adventures like that!! The best :) I see lots of great eye candy.. sigh. 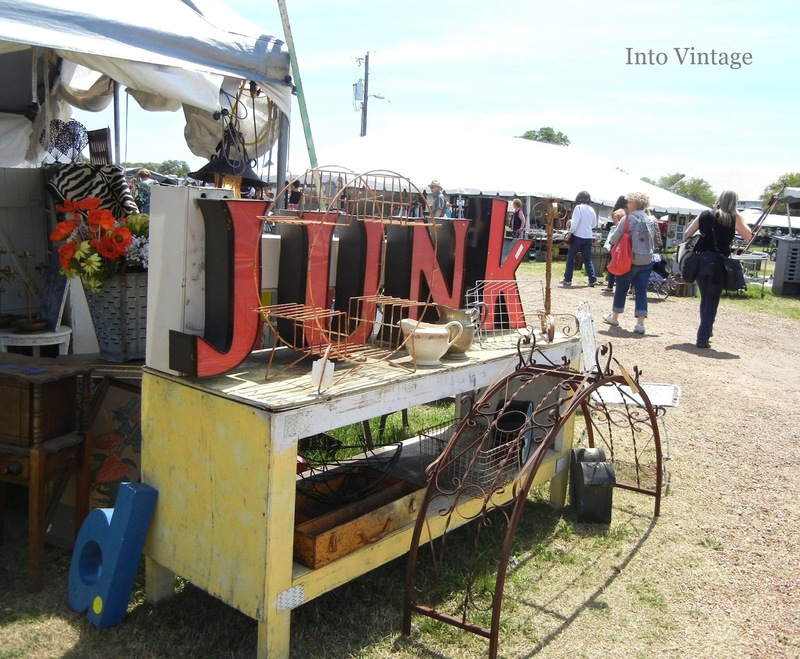 I love to 'JUNK' this is such great fun!!!! 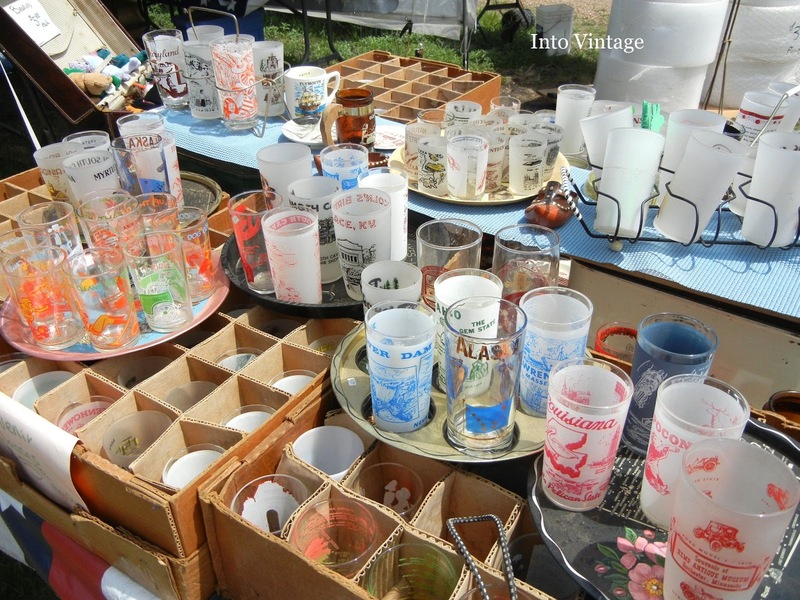 The vintage glasses.....the tablecloths...THE PYREX!!! OMG, I died and went to heaven over your pictures. I am so glad that you guys had such a fun time. This trip is definitely on our bucket list. Your post totally made me laugh and want to go back and do it all over again. (how come you did not whine about the weather as much as I did?) Love this post, loved traveling with you and loved the Round Top experience! I am so glad we got to share it together. I truly LOL'd at the photo of y'all's hotel room. Move on, hotel cleaning staff! We've got this under control! I'm so glad you guys had a great time and thrilled for you that you found some stuff to re-sell. Must have made the trip all the more worth it. Wowza! I can see that you had a good time by the looks of your hotel room:-) Did you fight over any junk? 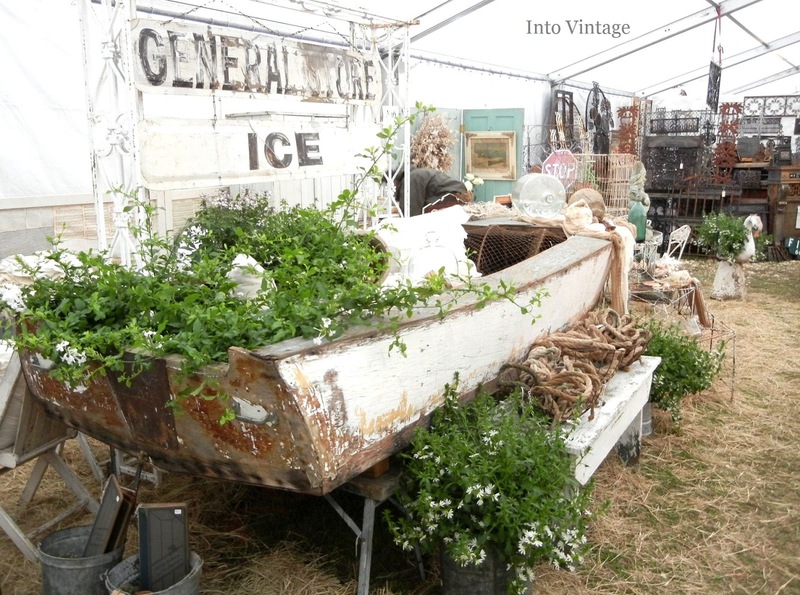 Junkin' sisters are the best. what a great trip! 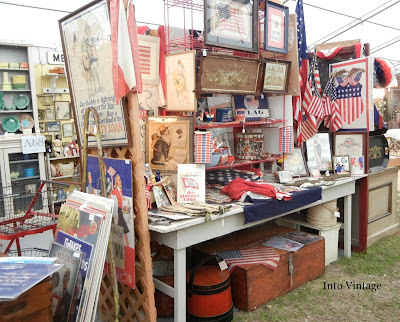 glad to hear you found some great treasures and passed on the $125 vintage tablecloths, as we say in wisconsin - uff da! love the pic of the room, just like christmas! welcome back. before I re-type my entire comment, did you get the first one? Oy! Loved your commentary and all the great pictures, especially the hotel room - lol. It is easy to see you two had a FAB time. 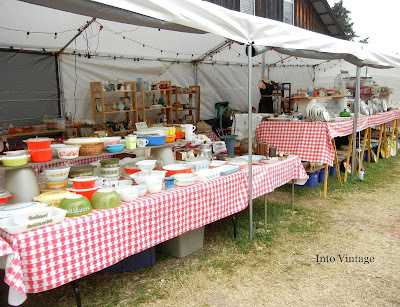 Love those enamel bowls - good score! BTW, I had today off and treated myself to a long stroll through Montecello and noticed that little green check box in your booth. I cleaned out my attic yesterday (well, at least started) and I have the file box mate to it, complete with key. I set it aside for next time I see you. 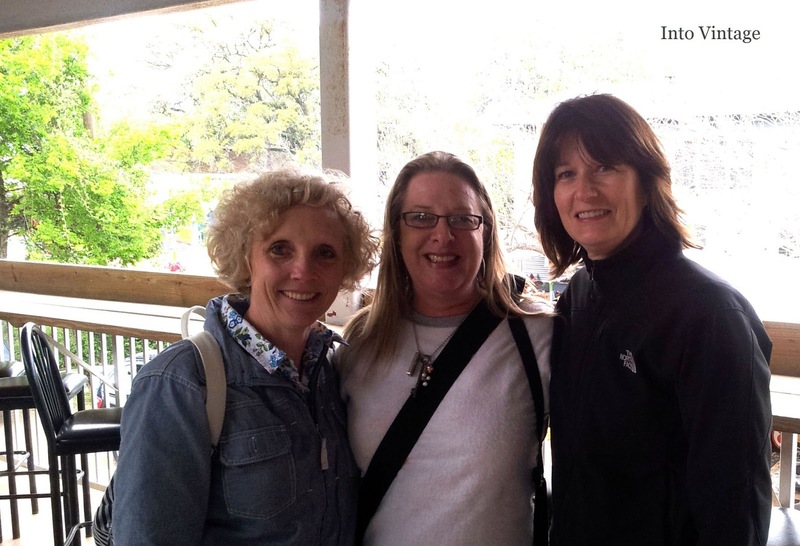 Such a fun post...I loved the tour of your time at Marburger...thanks for bringing me along! Hey Amy! 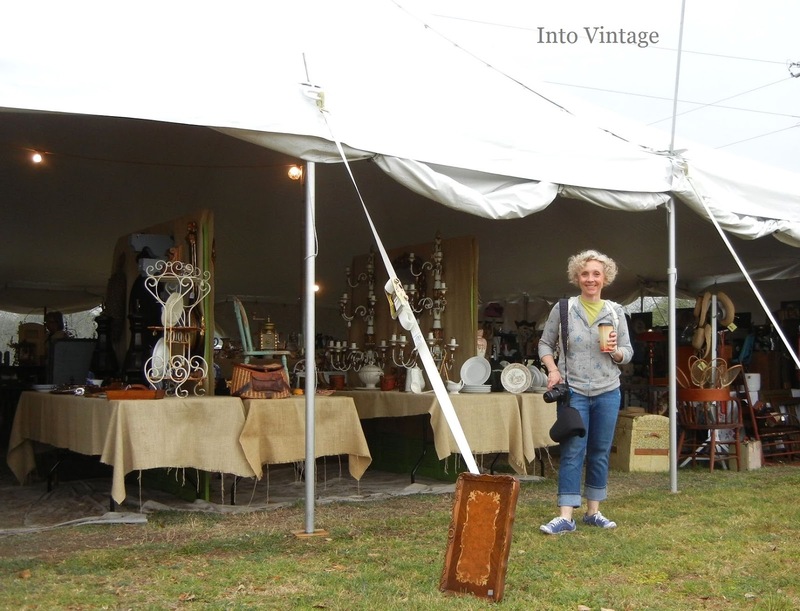 Now that you are Laurie are experienced Texas Antique Weekers, next year will be a breeze. I would love to join you, that is, if I'm still invited? I promise I won't back down like I did this year. All these pictures are definitely making me regret my decision not to go. So glad you had a great time! How fun that you got to hang out and got to see all that stuff! I may have had to take a second mortgage out on the house if I had gone down there. Hope you brought that little roadster home with you. The. interwebs ate my original comment. What I originally said was.....I really enjoyed Magpie's flashbacks. I felt like I was there with you, scarfing down pie. Sounds like it was a great adventure. Don't you just love those? Oh I am green with envy (in a good way) -- this is my dream trip and you did it AND met bloggy friends! What a hoot! I loved every single photo -- thank you for posting!! Looks like so much fun!! Was it impossible to not buy stuff that wouldn't fit in your suitcase? I think that shot of the hotel room pretty much sums up the fact that this was a VERY successful trip! I hope you gals do it all over again next year, so I can live vicariously through you and your magnificent junk! It did not occur to me until this very minute what your hotel room must have looked like at the end of each day. (Hope you tipped the maid.) I love that two of my favorite bloggers met one of my other favorite bloggers who I actually have met ... it's like one degree of separation or something. I have so many other thoughts (like: does anybody actually buy those $125 tablecloths?) but I think that'll hold you for now. Amy, the hotel room picture is my favorite!!! I like seeing the vendor set ups, too. I know you two had a WONDERFUL time and it shows in your post. Those enamel bowls are really great. Just imagine how much fun you will have next time when you know what you are doing! My Oh My....What eye candy! I would have gravitated to that table full of Pyrex!!! looks fantastic, i definitely want to go sometime! 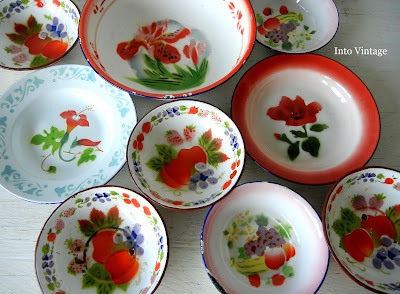 I have a couple of the enamel bowls you bought...i love vintage enamel!! 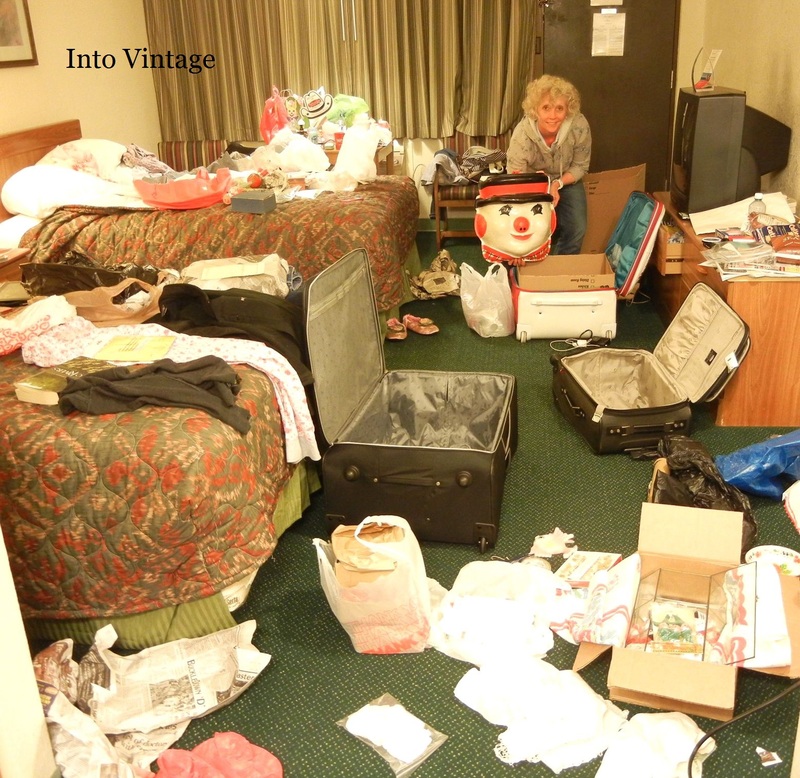 The photo of your hotel room reminded me of an antiquing trip my sister and I took to Tennessee and Kentucky. We brought several suitcases to take our loot back home. I bought a child's toy -- a vintage washing machine. We were stopped at the airport and our bags searched because their scans revealed suspicious objects, namely the toy washing machine. They thought it was a bomb! After much explaining, they believed our explanation that we were not terrorists ... I think. P.S. I am a new subscriber. Love your blog ... and your sense of humor. gosh, sorry it's been so long between visits. reading your fun and funny post makes me know that i've got to make more time for blog visiting. it's pure fun. Is it wrong to be so happy for you and Laurie and yet be so jealous at the same time? I can't wait to hear more and at the same time turn even more green with jealousy. Of course, I will turn a pretty shade of jadeite green. Looks like it would have been fun to shop there! 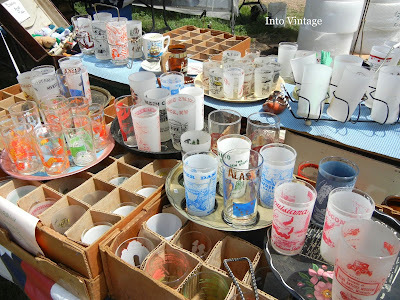 I am looking forward to going to the large outdoor flea market here in PIttsburgh! I did great there last summer. I am planning on going much more often this year.